The V10 is RRD’s new X-Fire range, championed by the master Antoine Albeau and derived from the V9 with only slight alterations. In this particular size, the 114 has had a refinement to its cutout shape, with an enlarged recess on its first tier, which then extends all the way to the back of the board. The result is said to be greater top end speed, more control and better glide through the gybe. Otherwise, the board’s design remains unaltered. 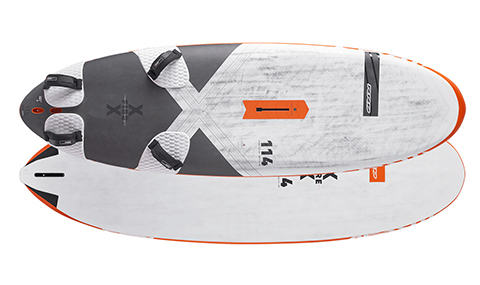 The third largest of a seven board line-up and produced solely in LTD construction, it comes supplied with DaKine Primo Velcro straps, thick deckpads (with raised toe cushions under the back foot), and a reinforced ‘foil box’ for those that like to literally fly above the surface of the water. The deck is wide and flat in the central standing area, domed on the rails for comfort whilst blasting and scooped significantly around the mid-section and nose, sinking the mast track deep into the board. We were really impressed with the V9’s performance last year, being one of the smoothest and most controlled in the group, so we were keen to see if we’d notice any difference in the changes made. Responding progressively rather than instantaneously when power is delivered, the first impressions of the X-Fire serve well to give you a glimpse of its nature as the conditions build. It is incredibly well mannered, which can be misconstrued as it possessing an underwhelming character in marginal winds, feeling somewhat ordinary and subdued compared to its rivals. Once properly lit up and powered (which, after all, is how slalom boards are designed to be sailed), the 114 really begins to shine and show its true credentials – it is supremely smooth to sail, cushioning any impact as it dances over crests. Push more power into the board and it willingly absorbs it, accelerating silkily as the feedback through the feet belies the speed you’re going. The pads provide excellent grip, whilst the raised toes in the back deckpad mitigate any burning sensation through the shin. 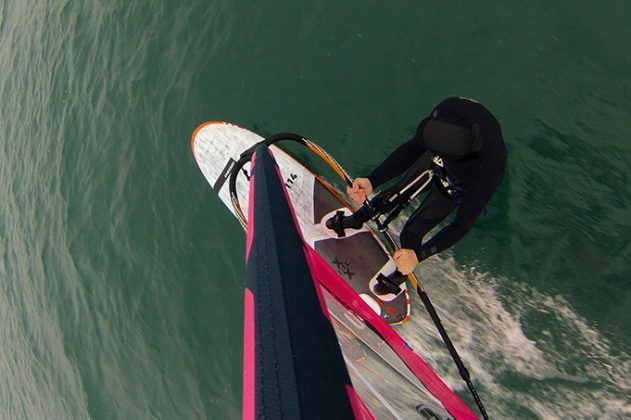 We found ourselves blasting deep off the wind into lumpier seas whenever in a drag race with our peers, knowing that we had a trick up our sleeves with the RRD. It doesn’t rise up on its fin as much as others, the fin box placed significantly further forward than any other board on test here. Instead it sits lower and waits for the prompts from the rider, but load it and you’ll be pleasantly surprised at its speed when you compare yourself to others. The sense of control you’re furnished with certainly belies its speed. This measured predictability was also in evidence during the gybe, cutting in easily and maintaining its bite and drive with little demand on the rider. Even in confused churned-up seas, the RRD encourages the rider to enter the turn purposefully, knowing the rails will hold if you ask more of them, before exiting the turn with speed. A smooth operator, the RRD craves power but asks of little else, combining a stunning turn of speed with endearing manners. For high-octane unrestricted blasting action, it doesn’t come much better than this.